Green tea is a beverage that has been consumed in Eastern cultures since ancient times for its perceived effects on health. Now consumed globally as a favored beverage, green tea is of greater scientific interest, due to its potentially positive effects on the mind and body, particularly on the immune system. By strengthening immune agents, protecting against oxidative stress that can damage cells and preventing autoimmune disorders like rheumatoid arthritis, green tea is thought to be highly beneficial for the human body. 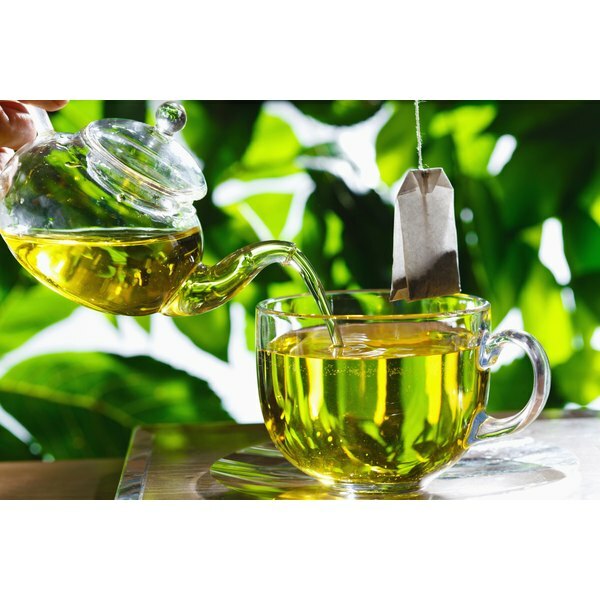 Catechin, a type of antioxidant in green tea, is thought to have a role in protecting against certain types of cancer, including mammary cancer after its initial growth has begun. These catechins are thought to function as tumor-fighting agents, directly preventing the growth of cancerous tumors, but they are also important in supporting the immune system as a response to exposure to carcinogens, or known cancer-causing compounds, according to a 2004 review published in “The Journal of Nutrition." This effect prevents immune system dysfunction when cancer is introduced or promoted. Aside from their anti-cancerous properties, the antioxidants in green tea are beneficial in generally strengthening the immune system. By protecting it against damage from compounds known as free radicals and similar compounds in the body, green tea keeps the immune system running normally. Healthy immune systems are better at handling infections from bacteria, parasites and viruses. Certain antioxidants called polyphenols in green tea have anti-inflammatory properties, resulting in a fundamental change in immune system response that could be beneficial in managing rheumatoid arthritis and other autoimmune diseases. Rats suffering from autoimmune arthritis that were fed green tea had higher levels of the immune system-boosting compound cytokine IL-10 compared to the control group, and demonstrated significantly reduced symptom severity, according to a 2008 study published in “The Journal of Nutrition." Green tea-fed rats also had lower levels of inflammatory cytokine interleukin (IL)-17, which is thought to have contributed to the reduced autoimmune inflammatory response. In a function related to its anti-cancerous properties, green tea also protects the body against damage from ultraviolet light rays. Drinking green tea prevented inflammatory and immune system-suppressing responses ordinarily associated with ultraviolet exposure, according to a September 2003 study published in “Current Drug Targets — Immune, Endocrine and Metabolic Disorders." This function protects the immune system against UV damage and reduces the severity of several skin problems associated with that damage. The same study suggested that topical use of epigallocatechin-3-gallate, a compound found in green tea, held a similar protective function.